The region’s anti-DUI free ride service is switching from taxicabs to ride-hailing service Lyft, starting this St. Patrick’s Day. Officials with nonprofit Washington Regional Alcohol Program announced the new partnership last week. Lyft, a competitor of market leader Uber, will provide the SoberRide service throughout the D.C. region through the end of the year. The free St. Patrick’s Day Lyft rides begin at 4 p.m. on Friday, March 17, and continue until 4 a.m. on Saturday, March 18. During the 12-hour period, area residents aged 21 or older can enter the code SOBERRIDE in the Lyft app’s “Promo” section to receive safe transportation home worth up to $20 for free. The code is valid for new and existing Lyft users. Lyft will also donate $1 to WRAP for each new Lyft customer using the SoberRide code in 2017. Previously, the SoberRide program partnered with local taxi firms, including with Red Top Cab of Arlington, to provide free rides. WRAP president Kurt Gregory Erickson did not respond to requests for further comment on the switch. Just over 330 people in the D.C. region used the cab-based SoberRide service this past New Year’s Eve. 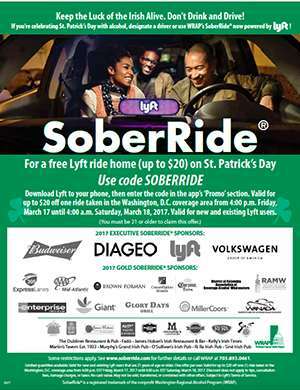 Besides Lyft, the sponsors of this year’s St. Patrick’s Day SoberRide program include O’Sullivan’s Irish Pub in Clarendon and Sine Irish Pub in Pentagon Row. According to the National Highway Traffic Safety Administration, one quarter of traffic deaths nationwide during the 2015 St. Patrick’s Day celebrations involved drunk drivers. Arlington County police spokeswoman Ashley Savage said officers do a great deal of outreach to educate revelers of the risks involved in drinking and driving. In previous years, Savage said, that outreach has coincided with the Shamrock Crawl bar-hopping event in Clarendon. But even with those festivities canceled this year, Savage said the outreach and education will continue. “Anytime there are alcohol-related holidays, we always make a point to be extra cautious as officers for those driving under the influence,” she said. Since 1993, the SoberRide program has provided 66,296 free safe rides home to would-be drunk drivers in the Greater Washington area.